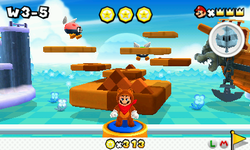 World 3 is the third world accessed in Super Mario 3D Land. It's a pale blue meadow with clouds and an ocean. 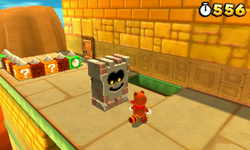 It contains six levels and a blue Toad House. Inside it, Mario can view an Album and save pictures from it. World 3-1 A desert temple course with Sandmaarghs and Wallops. 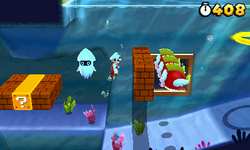 World 3-2 The first underwater course of the game. 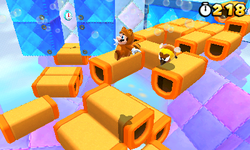 World 3-3 An athletic course with mattress-like platforms and Donut Lifts. 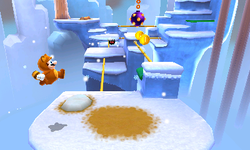 World 3-4 The first snow course, packed with lots of tightropes. 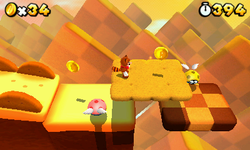 World 3-5 An auto-scrolling stage with cookie platforms. Requires 15 Star Medals to be unlocked. 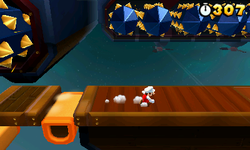 World 3- An Airship course with Skewers and Spiked Balls. The boss is Boom Boom. This page was last edited on August 31, 2018, at 23:31.